After three years of lawsuits , leaving co-founders and leaks , Respawn Entertainment finally showed off its debut sci-fi shooter to close out the Microsoft press conference. The game's universe pits a scrappy militia against the “Interstellar Manufacturing Corporation” for a yet-to-be-announced reason (I'm guessing the blandly-named corporation is the malevolent force in this equation). 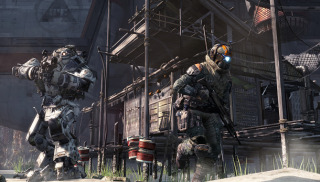 Titanfall won't have the six hour single-player campaign format Respawn is partly responsible for. Instead, Titanfall will have “heroic set piece moments traditionally found in the campaign mode.” We're not sure what that means quite yet, but we'll let you know the moment we do. The newly-minted gameplay trailer shows soldiers leaping onto rooftops and wall-running on conveniently placed billboards while gunning down opposing players. You can then forgo your superhuman mobility for raw power in a mech. Mechs aren't a ticket to immortality, as gameplay footage shows a soldier latching onto a mech's back to deal some damage to the wiring. Still, I'm sure the layer of bulletproof metal comes in handy. Judging from what we've seen, it seems like Respawn is attempting to break new ground with Titanfall. Sure, it looks like your usual first-person shooter with vehicles (mechs) but it's novel for a non-MMO to fold campaign and multiplayer into a single mode.